Violence and bloodshed have marked the relationship between India and Pakistan since the two countries gained their independence from British rule almost 70 years ago. This tense history is still reflected in relations between some Indians and Pakistanis, and many who immigrate to the United States carry the negative sentiments with them. But in Los Angeles, one university class in Hindi and Urdu tries to dispel myths about people from these neighboring countries. 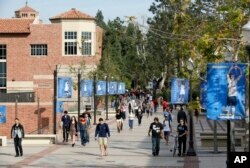 FILE - A campus scene at the University of California-Los Angeles. Gyanam Mahajan, who teaches language and culture classes at UCLA, said such initial separation is not unexpected. The immigrant families from India and Pakistan come with resentment and mistrust of one another's identity, "and when they come here, they come with this baggage. ... They come with this feeling that Hindi and Urdu are different languages,” she said. Mahajan said Hindi, one of the official languages of India, and Urdu, the national language of Pakistan, are so similar that speakers of one can understand the other, even though the writing systems are different. It's a surprise for many students, including Indian-Americans Trisha Patel and Rohan Luhar. “It’s surprising to know that you pronounce everything the same way,” Patel said. “I didn’t really know what Urdu was before taking this class,” Luhar said. The students say a class like this one would never be offered in Pakistan or India. “As I say in my class, the future of South Asia is actually here in this country,” Mahajan said. Patel and many of her classmates said the class had opened their minds. “The professor does a great job of helping us understand the bridge between the cultures and showing us that there’s not many differences, regardless of what it may seem like,” she said. The hope is that these students will become ambassadors of peace and share what they’ve learned with their friends and families in the U.S., India and Pakistan.